Excessive dog barking is a real nuisance, but before you can address the problem you need to understand why your dog is barking. Remove the problem and he'll stop. It's as simple as that... well almost. Find out why dogs bark and discover 5 effective methods to stop barking dogs. It's a fact of life - all dogs bark from time to time! 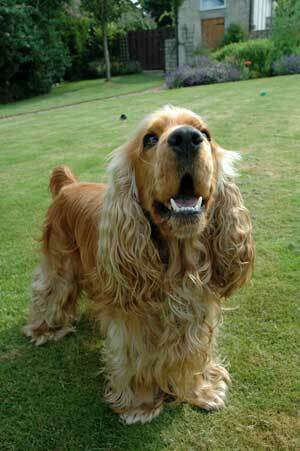 Dog barking is a natural canine behavior. It's how they communicate and a bark can mean anything from 'Let's play! ', 'I'm hungry', or 'I'm bored', to a warning of potential danger...'Hey mom, there's a prowler outside!'. BUT when it continues incessantly, it can become a real problem for you and your family, not to mention your neighbours! Your Cocker should be allowed to bark in order to communicate with you or to alert you to a potential danger. However, he has 'sounded the alarm', his barking should stop. Don't allow dog barking to become a problem because once your dog has gotten into the habit of barking, it's very difficult to stop. In many cases you can stop your dog's barking simply by removing what's upsetting him. If he's being teased by the kids and he's becoming frustrated, stop the children teasing him and your dog will stop barking. If your dog is hungry, feed him! 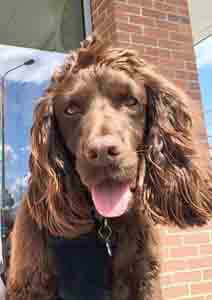 Tired, well-fed and watered, contented Cocker Spaniels are happy dogs and happy Spaniels don't nuisance-bark! In the above examples, it was the causes of the dog barking that needed to be addressed, not the barking itself. However, where the cause can't be removed, you must find other ways to address it. That's the reason you need to work out what's causing your dog to bark before you can begin to tackle the problem. A dog barking for a prolonged period usually means that there's something wrong and he's trying to let you know. If you can't work out why your dog is barking and you're confident he's not ill or injured, it's possible that his barking has simply become a habit (as unsociable and annoying as it is) and he's barking simply for the sake of it. Continued, incessant dog barking is excessive and unnecessary and is exactly the type of barking that we want to discourage, especially before it become a habit. If your Cocker has developed this annoying habit, take a look at some of the methods below that you can use to help stop your dog barking. One of the best and easiest remedies to stop your dog barking is to teach your dog to bark and then teach him to stop. Yes, it does sound contradictory, doesn't it? But I promise you, it works. This method of stopping a dog from barking is works best if it's taught to a puppy before it discovers the joy of barking, but although it's much easier to teach this command to a young puppy, it can also be taught to an older dog. It may, however, may take slightly longer. If this sounds right for you, follow the link to learn how to teach your puppy to stop barking. If you have a puppy with an excessive barking problem, and the above simply isn't working for you, you may find this article called 'How To Stop Your Puppy Barking' very useful to help you nip it in the bud. Many of the methods used also work with adult Cocker Spaniels. Sometimes our dogs bark at visitors, either because they're over-excited, or because they believe the visitor is a threat to his pack. If your dog is barking at visitors, delivery men, garbage collectors, or the postman, follow the link for some great ideas to help your dog overcome his barking habit. Most Cocker Spaniels enjoy being outdoors, but unfortunately some turn into barking demons as soon as they're let out into the garden. Vocal pets can sometimes drive you (and your neighbors) to distraction, barking at everything from birds and rustling leaves, to their own bloomin' shadow! 'Barking Mad In The Garden' will help you to stop your dog barking outside and in no time at all you and your neighbors will once again be able to enjoy the peace and quiet of your own yard...ah bliss! There are many owners who recommend using a barking correction collar on their dogs, usually because all else has failed. A correction collar is a device worn around the dog's neck which triggers a spray or a mild current each time your pet barks. The aim is to teach the dog that each time he barks something unpleasant (but not harmful) will happen and this unpleasant experience will make him think twice about barking again, and eventually he will stop barking completely. One of the down sides to a correction collar is that another dog's barking can set it off. If you're on a tight budget, a simple and cheap alternative to the correction collar is a water spray. You can use an ordinary toy water pistol or garden spray bottle, simply fill it with water or water and lemon juice. The problem with a spray that you activate is that he can only be 'punished' for barking when you're around; if he barks when you're not around he won't be sprayed which results in inconsistency, making this method slightly less effective. You can learn more about barking deterrents here. The methods listed below follow a punishment based approach (and/or are a last resort) to prevent a dog barking. I've known of, and seen, many owners employ these 'tactics', however, I believe that they're harsh and rather drastic. Judge for yourself. Removal of the vocal chords (Vocal Cordectomy or Surgical Debarking). This 'remedy' is only used in extreme situations where chronic barking simply cannot be controlled. The operation doesn't normally remove the bark completely; it simply reduces it to a hoarse croak. However, the noise levels are considerably reduced. Some frantic owners have actually resorted to taping their dog's muzzle closed! This is cruel and I certainly don't recommend it. Smacking the underside of the dog's muzzle every time he barks - I don't think so. However, it's said to work like the correction collar. Staring into the eyes of a barking dog until the barking stops and the dog goes into 'submissive mode'. This is a very dangerous practice and certainly not recommended! Muzzle your dog. Although this may stop your dog barking, it won't stop him from being vocal. Using a muzzle in this way is cruel, it's not what muzzles are made for. There are other more suitable methods available. A tin can, or a bottle, containing pebbles or coins, is shaken vigorously each time he barks. Dogs don't like the sound it makes, and although the rattle bottle may work, I don't recommend using this method without first seeking professional advice from a qualified canine trainer or animal behaviorist as it could make your pet aggressive if not used properly. Whacking your dog on the nose with a rolled up newspaper when he barks? I don't think so! Personally, I believe all of these methods to be a little over the top as they are too aggressive and I would never recommend any of them. Apart from being harsh (and in some cases, downright cruel!) they're also only short-term 'solutions' as they'll only work when you're near enough to your pet to give the 'correction'. Wherever possible I recommend you stay away from the negative, punishment based approaches shown above and use positive, reward-based training methods instead. Use punishment based training methods at your peril. If you do, you may end up creating other behavioral problems in your Cocker Spaniel, for example, biting or aggression, particularly towards the person giving the punishment - you. "Reward based training is much more effective and kinder to your dog than negative, punishment based training." When the postman or a delivery-man comes to the door, your dog is whacked for barking, whether it's with a newspaper or something thrown at him, and he feels pain each time. It won't be long before he begins to associate his pain with visitors to your home which could eventually make him aggressive not only towards the postman, but towards all visitors. Our dogs learn by association. If you're going to give your pet a (reward-based) correction you must 'catch him in the act' so that he understands why he's being corrected. I'm talking seconds here. Leave it too long and he won't make that connection. Acknowledge your dog's bark (he's telling you that you have a visitor, say the postman) and then tell him to be quiet. Let him see the treat in your hand and if he stops barking, reward him. If you reward your pet the moment he stops barking, he'll soon learn that when the postman arrives, it's treat time...the postman is no longer a threat. Always acknowledge your Cocker Spaniel's barking. Let him see that you understand what he's trying to tell you. For example, if he's barking at the door or the window, go and take a look. If there's nothing to be worried about tell him and lead him away. If you've taught him the "Be Quiet" command, use that but add something like, 'it's okay', or 'we're safe'. Choose words you feel comfortable using and stick with them. Be consistent. As you're reassuring your dog, take hold of his collar and gently guide him back to where you were sitting and give him a pat. In your dog's eyes, he's let you know that there was a potential problem and you (as his pack leader) have investigated and have decided that there was no danger. You have acknowledged his warning. If you don't investigate the problem, his barking will continue, probably even louder, so ignore it at your peril! Is Your Dog Barking For Attention? If there's a possibility that your Cocker is simply barking for attention, you could be making matters worse by fussing over him when he barks. Giving your dog attention when he 'demands' it by barking will just confirm to him that his barking get's him exactly what he wants. He'll soon learn that his barking works and will only do more of it when he wants something else from you...because it works! Before you decide your Cocker Spaniel is barking for attention, ask yourself whether or not you're spending enough time with him. Do you give him enough exercise? Do you play with him? Is he bored? Your Spaniel needs at least an hour's walk and 15-20 minutes play each day to burn off energy; more if you have the time. Wear him out! Reward him with your attention and praise only when he's quiet and well-behaved to encourage and reinforce his good behavior. If Your Dog is Barking, Don't Shout At Him! The worse thing you can do to stop your dog barking is to shout at him, but as frustrated dog owners, this is sometimes exactly what we do! To your dog, your shouting sounds like you're barking too and in his eyes you're either reinforcing his decision to bark in the first place or you're joining in the fun! Shouting will only encourage him all the more, usually louder and with more determination! If after trying some of the above methods you still haven't managed to stop your dog barking, I recommend you consult your vet. If your vet gives him the all clear, then perhaps you should consider contacting a professional trainer, or animal behavioral therapist for advice? They might suggest that your Cocker stays with them for a few days so they can monitor his behavior for themselves before deciding which is the most suitable therapy for your dog. Alternatively, they may prefer to work directly with you and your pet to come up with a strategy to stop your dog barking. They'll help you to communicate better with your pet and work on his barking problem. Either way, it's a win-win situation, don't you think?